Blazer: Tesco. Jumper+Tights:Topshop. Skirt: H&M. This skirt is a new purchase from H&M. The colours so intriguing, it's not red, yet it's not orange, it's that odd inbetween colour which just makes it so quirky, and therefore a must have. Also came in a variety of different colours but this was the one that kept catching my eye. It fits and sits really nicely, exactly where it's meant to, i was overly pleased with this purchase! This oversized jumper is something i've had for a good while but because it sits quite weirdly when allowed to hang, i find it so difficult pairing it with pieces of clothing.. until i bought this skirt. Tucked in and allowed to ruche at the top gives this smart look a bit of a laidback style therefore not appearing to serious. 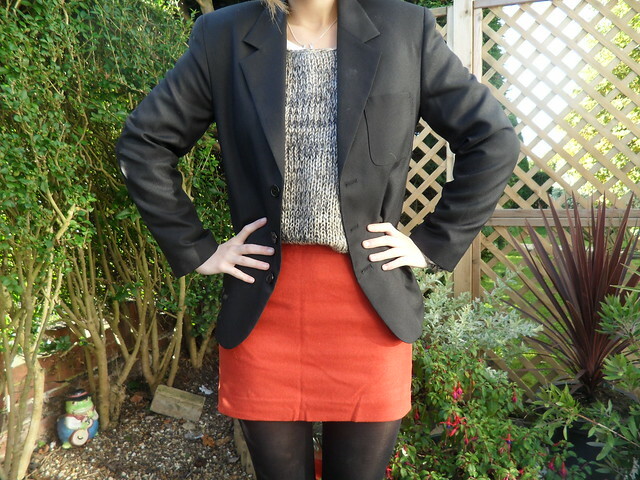 So onto the blazer... well i picked this up from my local supermarket in a dash to find new cheap school clothes before the term started. The only blazer there that fitted me, a boys black blazer in a size 11-12yrs. To be fair, i actually like it, it's totally different to the womans blazers around the High Street! 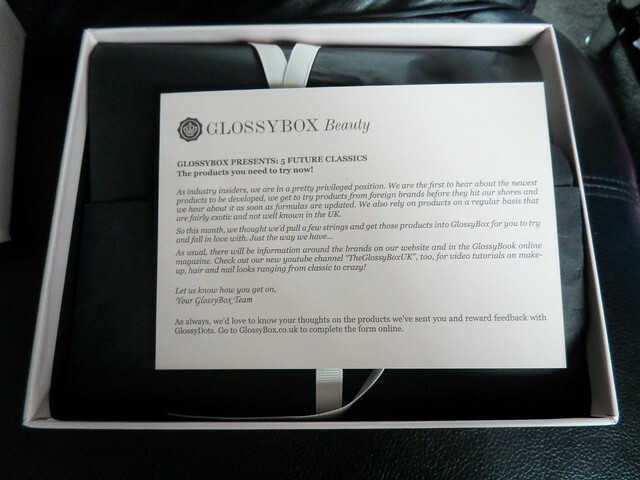 In other news, i recieved my first Glossybox a few days ago and thought because it was my first, a post was in order! I must say i was pleasently suprised with the contents, all products that i recieved will be used! Perfect for me really! Voted 'Best Exfoliator' by You Magazine. A harmonious blend of pure Dead Sea Salts, vitiman E and coconut oil, with a hypnotic citrus aroma. A night treat for the face and neck. This 'magic; night cream smoothes fine lines and improves pigmentation marks. Using pineapple and wild berry extracts, dead skin cells and lifted away revealing younger skin. Eyebrow experts HD Brows have developed this fantastic multi-use palette containing four matte eye-brow colours. They double up as an eye shadow and eyeliner aswell as lasting 24 hours. GLOW is a weightless spray that adds deep, lasting shine. It's unique formula also helps to smooth hair, control frizz and reduce static. The result? Incredible all-over shine that leaves hair glowing. Plum is the signature fragrance by world-renowned celebrity makeup artist Mary Greenwell. A stunning classic chypre with a memorable modern twist. love the colour popping red skirt!